Most of Denmark resembles Greenland at the moment. Many regions recieved over 50 cm of snow yesterday alone and one town - Hobro - was cut off from the rest of the world for most of the day. 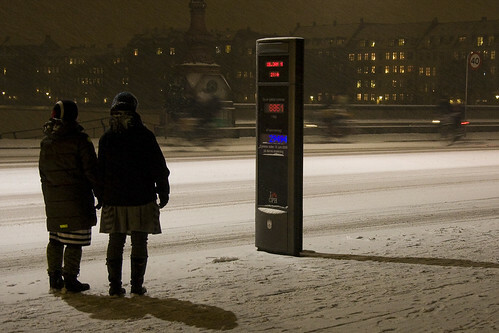 Copenhagen wasn't the recipient of half a metre of snow but the outer edges of the snowstorm that hit north Denmark rolled over the city last night and dumped 5 cm on us. 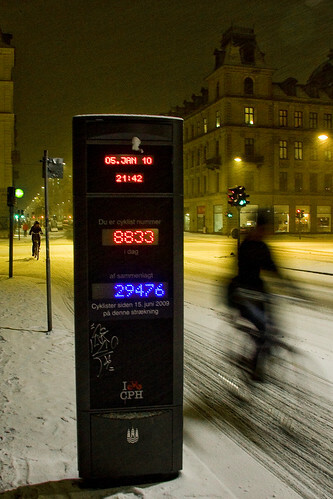 I was out and about and took the above shot of the bike counter on Nørrebrogade at about 21:30. Okay, it says 21:42 on the counter. 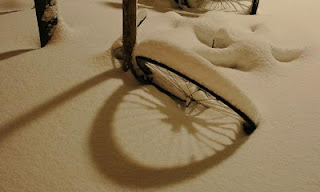 While 80% of Copenhageners who use the bicycle continue to cycle throughout the winter there is a further drop when the weather features snow. The busses and trains are filled on days like this. Although as the bicycle counter will attest, over 16,000 people on bicycles rolled past this point yesterday, which is still very respectable. Images from Denmark yesterday from Danish Meterological Institute. I also caught these two walking past the counter and stopping up to look at the numbers while some cyclists rolled past in the background. 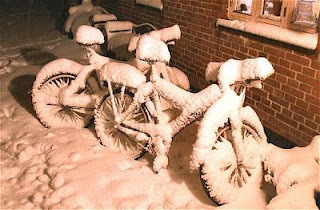 See more Winter Cycle Chic shots over at Cycle Chic now and in the coming days.